Dwell on Design, taking place June 23-25 at LA’s convention center, is upping its game. In addition to having Sir David Adjaye speak and showings from the Architecture + Design Film Festival, it is collaborating with Madworkshop in a silent auction to aid the foundation’s work with the homeless. Founded by David and Mary Martin to benefit education and young designers, Madworkshop recently endowed a Homeless Studio class at the University of Southern California. 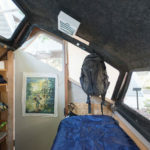 As a result, one of the students’ tiny, nomadic shelters is currently a prototype at Hope of the Valley Rescue Mission. 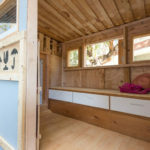 At the Dwell on Design expo, students will actually construct a tiny home of about 80 square feet from already scavenged materials. Think of a barnraising to get the picture. The result will be auctioned off, giving the winner a backyard spare office or guest room. Proceeds go to the pilot build-out in Sylmar, California, as proof of concept.